Number of mosquitoes that bit me while taking these pictures...457. During the summer months, and especially while I'm pregnant, dresses and skirts are my go-tos...(oh and these leggings...all day, every day these leggings). But when those dresses and skirts and leggings are unavailable, (we have SO much laundry at this house! ), I pull out these trusty, full-panel black shorts. 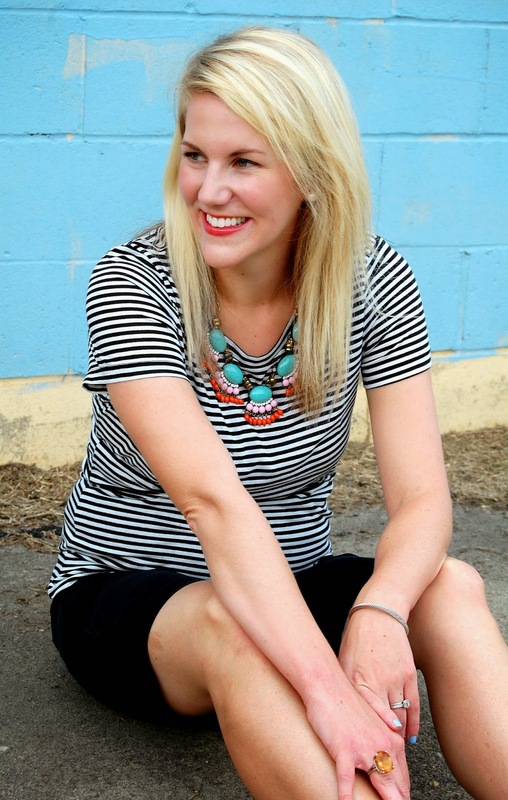 This is just one way I spice up a basic tee with shorts....with a pattern and a statement necklace. And just as a side note, this is a "regular" shirt that I found in a bigger size in the Target clearance section for under $2! PS..I feel like I majorly popped this past week. Yay! Grow, baby, grow! I almost bought that shirt at Target yesterday! However, being ~33 weeks pregnant, even the bigger size was getting snug/short :) I have full panel black shorts and grey shorts that I *love* these days! You are always so cute, Ashley! So cute I love the outfit! Your belly!!!! Eeek!!!! So darn cute girlfriend. haha i was standing outside the other day for pics and got bit by about 457 mosquitos too! but you look so cute! yay for belly pop! Ashley you look sooo cute!! This is cute! The loafers and necklace make it really special and fun, though I know it's comfortable as well…win/win! Such a cute outfit! I love the little bump! You look great! Comfy yet stylish. Gorgeous statement necklace. I LOVE that outfit - so simple yet so stylish. I need a striped shirt like that. My summer wardrobe is essentially skirts and maxi dresses right now. And pj pants when I'm lazy lol. 457 is the approximate number I've gotten too. You do look like you've popped and it's adorable! LOVE those loafers! Such a great look on you! gahhh mosquitos, cannot deal with them. This looks so comfortable! 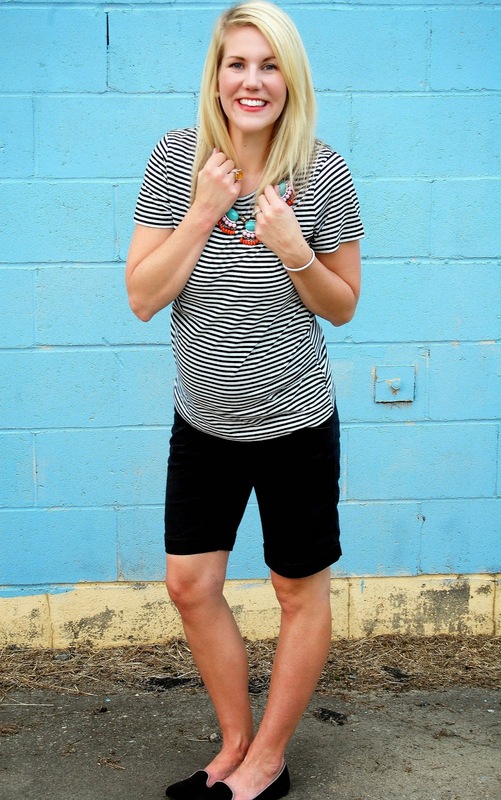 I love the stripes with the shorts. Basic with a little something special. You are just glowing! Cute outfit. A fun necklace always takes it up a notch.